The Portable Debugging Device provided your link to find and then save Shelby Logan. 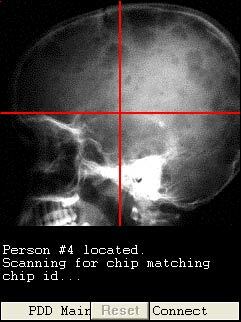 Shortly into the Game, teams obtained a standard Agency-issue Portable Debugging Device, left behind by Shelby Logan as a tool to enable them to find him and debug the chip implanted in his brain. 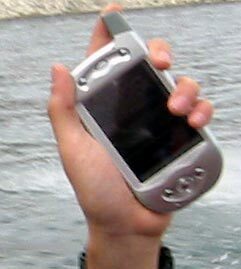 The device was created using a PocketPC Phone Edition handheld PC, modified such that no Microsoft-visible software was shown. When the teams retrieved the device and turned it on, the Portable Debugger software booted up immediately, and the device was completely under software control-- even the power button would no longer work-- the device could not be turned off or modified in anyway. Upon making the required telephone call to enter the A# number at that location, Shelby Logan's phone message said "please wait while I enable the device", and seconds later the device itself was modified remotely with messages and software from Shelby. After completing Shelby's puzzles, the device reveals Shelby Logan's identity and location. You must connect the device to the chip implanted in his brain in order to bypass chip security, and then disarm the chip to save his life. With the debugger device connected to the chip inside your brain, you must wait for a chip bug to occur so that you can enter a decryption key and bypass chip security to disarm it. Shelby has hidden the decryption key inside his friend Templeton, which you must retrieve on your own. 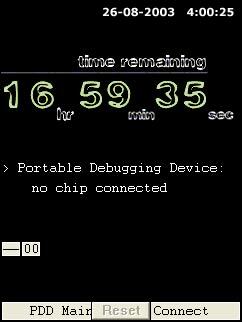 At precisely 1:30am, the device awakens to notify you that the chip bug has occurred! You have 30 seconds to enter the decryption key and gain access to the chip's inner structure. Unfortunately, every team failed to do this in time and properly, and the window of opportunity has closed. It appears that all is lost-- your one chance to disarm the chip seems to have passed-- but then at 2am, Daylight Savings Time ends (10/27/02) and the device (and chip) reset their clock back to 1am. You'll have another chance at 1:30am-- the second time-- to enter the decryption key and gain access to the chip's structure! Shelby (and your) life is saved! Time ran out... Shelby is dead. After one phone call to the A# system, the Portable Debugging Device is modified with a countdown timer and access to Shelby Logan's puzzles. 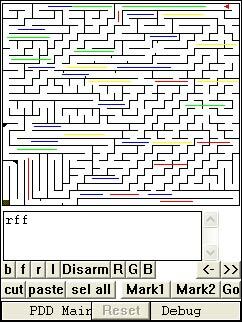 Once Shelby is found and the Device is connected, the chip inside his head must be accessed by building a program to navigate this maze. Download the ZIP file below and copy its contents to a folder on your hard disk. Then open it and double-click PUZZLE.EXE. Note: the README.TXT file included describes known bugs and issues on the PC, as well as providing a number of commands that allow you to use this device-software without having to wait 24 hours while new puzzles and other events are enabled as they were during the actual game. - the device software starts up and the device has not been activated yet by Shelby Logan. Click "Activate Device" to see what teams experienced when they called the WITSEC phone system and entered A#16294 at Black Island. - once activated, the device waits until the correct time to start showing puzzles... and on your PC the time will be incorrect. Choose "Time Warp" to set the device to 20 hours and counting, in order to enable the first few puzzles. To enable more puzzles, you need to solve the ones presented and keep choosing "Time Warp" so you don't need to wait 20 hours for all puzzles to be available. The device provided the main storyline "meta-puzzle" to the Game, and worked well except for one problem... during the Game our GC technician accidentally issued a command that accelerated time for all the teams, effectively "killing" Shelby. Fortunately, we had sufficient remote control that he was able to again reset the device and put teams in a position to solve puzzles and attempt to complete the maze in time to save Shelby's life. In the end, though, the technical problem made it difficult and near-impossible for teams to finish in time, so we're not sure that any team actually solved all the device puzzles in order to succeed in the overall objective of the Game. If Shelby were real, looks like none of these Game teams could have saved him.